Turbine reckons the tried and tested $X-a-month pricing model still has its place. "It's probably not right to say the subscription MMO is dying," said spokesman Adam Mersky in an interview with Eurogamer. "It's probably more right to say the idea of forcing a player to only have one option for having to consume your content -- that's probably dying." 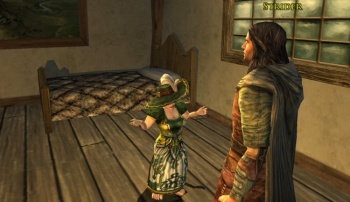 Turbine's most notable games, Dungeons and Dragons Online and Lord of the Rings Online, have both fared better as microtransaction-driven "free" games than they did as traditional, subscription-based titles. "If we were going to release another MMO, we would not come out and - from my perception - launch it as a subscription game," Mersky continued. "The right choice would be to make it a player-choice of subscription or free-to-play." Mersky went on to claim that Turbine pioneered the switch from a subscription to F2P model. It's worth noting, however, that Anarchy Online featured a F2P option five years before Turbine introduced the option in Dungeons and Dragons Online. Rightly or wrongly, I suspect a lot of people are watching The Old Republic's peformance very carefully. If the combined might of Bioware's (slightly tarnished) reputation and the Star Wars license can't maintain a subscriber base at the traditional $15 price-point, I suspect we'll be seeing a lot more high-profile MMOs launching as F2P titles.